In the quest for smaller, longer-lasting, more powerful batteries, one scientist may have just produced the breakthrough we’re waiting for. In the quest for smaller, longer-lasting, more powerful batteries, scientists have tried many alternative approaches to battery chemistry. One may have just produced the breakthrough we’re waiting for. The urban legend is that there was a small leak in a battery cell that chemist K M Abraham was testing in his laboratory in 1995, which provided the cell with a far higher energy content than expected. Rather than try to fix the leak, Abraham investigated and discovered the first rechargeable lithium-air (Li-air) battery. So far this discovery hasn’t led to any technically viable products, but a paper published in Science from a University of Cambridge research group may be about to change that. In 2008, Tesla amazed industry watchers with its bold, electric Roadster car that ran on off-the-shelf lithium-ion (Li-ion) batteries, the sort that power everything from smartphones to laptops to cameras and toys. Since then, not only has the market for electric vehicles quickly grown, but so has the average range of the batteries that power them. However that growth needs to accelerate: from 1994 it took 20 years to triple the energy content of a typical Li-ion battery. The new research, led by professors Gunwoo Kim and Clare Grey, experimented with Li-air cells that use only an electron conductor, such as lightweight, porous carbon, instead of a metal-oxide typically used in a Li-ion battery. Practically speaking, this saves a lot of weight, but brings its own difficulties. 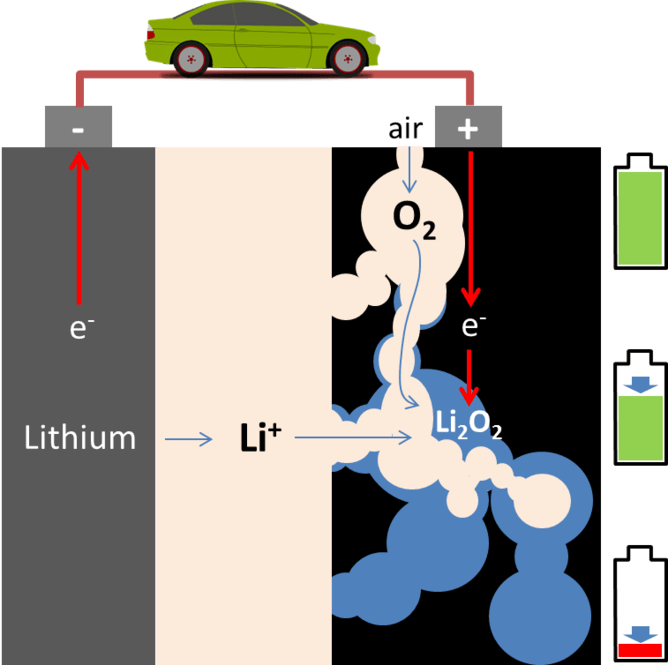 A Li-air cell creates voltage from the availability of oxygen molecules (O2) at the positive electrode. O2 reacts with the positively charged lithium ions to form lithium peroxide (Li2O2) and generate electric energy. Electrons are drawn out of the electrode and such a battery is empty (discharged) if no more Li2O2 can be formed. Theoretically, a Li-air battery is empty (discharged) when all pores of the positive electrode (right-hand side) are filled with lithium peroxide, shown here filling from top to bottom. However, Li2O2 is a very bad electron conductor. If deposits of Li2O2 grow on the electrode surface that supplies the electrons for the reaction, it dampens and eventually kills off the reaction, and therefore the battery’s power. This problem can be overcome if the reaction product (lithium peroxide in this case) is stored close to the electrode but does not coat it. The Cambridge researchers found a recipe that does exactly that – using a standard electrolyte mixture and adding lithium iodide (LI) as an additive. The team’s experiment also include a rather spongy, fluffy electrode made of many thin layers of graphene filled with large pores. The last important ingredient is a small amount of water. With this combination of chemicals, the reaction as the battery discharges does not form the Li2O2 that would gunge up the electrode’s conducting surface (see image below, left hand side). Instead it incorporates hydrogen stripped from the water (H2O) to form lithium hydroxide (LiOH) crystals. These crystals fill the size of the pores in the fluffy carbon electrode, but crucially they don’t coat and block the vital carbon surface that is generating the supply of voltage (right hand side). So the presence of lithium iodide as “facilitator” (though its exact role is not yet clear) and water as co-reactant in the process boosts the Li-air battery’s capacity. How will Li-air change things? This process which ensures the electrode surface is kept clear is essential to boost battery capacity. However, the drawback is that the same lack of electrical contact between the electrode and the discharge product that boosts its capacity should in principle make it difficult to recharge. Again, it turns out the lithium iodide additive is the missing ingredient needed: at the electrode, negatively charged iodide ions are converted into I3 (triiodide) ions (see picture, right-hand side). These combine with the LiOH crystals and dissolve, allowing for a complete recharge by clearing the pores. In fact this mechanism is even more effective than the recharge of Li2O2 attached to the electrode surface. Since the electrons do not need to travel through a Li2O2 layer, less voltage is required to recharge a Li-air battery with the iodine additive than without it. So less energy is needed to recharge the battery, which would make an electric car running on such a Li-air battery more energy efficient. The study’s authors present data that are approaching an energy efficiency of around 90% – which brings this new battery technology close to that of conventional Li-ion batteries. Their findings reveal a promising way forward for Li-air technology, at a time when many other research groups have given up. As more researchers return to the subject following this breakthrough, perhaps a commercial Li-air battery will finally become reality.